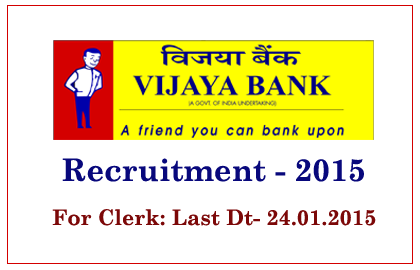 Vijaya Bank has announced openings for the post of Clerk (Sportsmen). Eligible candidates can apply for this post before 24.01.2015. More details regarding this recruitment were mentioned below. Should represent the state in national event, district in state event or in university. Candidates will be selected on the basis of the field trials and personal interview. Eligible candidates can apply by filling the application form which was given in the notification link below. And send it to the below mentioned address, in a closed envelope super scribed “Application for the post of Clerk (Sportsmen)”. Your Application should reach on or before 24.01.2015.